O Thou, whatever title suit thee! Auld Hornie, Satan, Nick, or Clootie. freedom and whisky gang thegither, Tak aff your dram! The tither was a ploughman’s collie, A rhyming, ranting, raving billie. His locked, letter ’d, braw brass-collar, Show ’d him the gentleman an’ scholar. A fig for those by law protected! Liberty’s a glorious feast! Courts for Cowards were erected, Churches built to please the Priest. The best-laid schemes o’ Mice an’ Men Gang aft a-gley. From scenes like these, old scotia’s grandeur springs, That makes her lov’d at home, rever’d abroad: Princes and lords are but the breath of kings, ‘An honest man’s the noble work of GOD’. There’s some are fou o’ love divine; There’s some are fou o’ brandy. I was na fou, but just had plenty. Some books are lies frae end to end, And some great lies were never penn’d. My curse upon your whunstane hearts, Ye Enbrugh Gentry! The tythe o’ what ye waste at cartes Wad stow’d his pantry! O Thou that in the heavens does dwell! Wha, as it pleases best Thysel, Sends ane to heaven, an’ ten to hell, A’ for Thy glory, And no for ony gude or ill They’ve done before Thee! Gie me ae spark o’ Nature’s fire, That’s a’ the learning I desire. They gang in Stirks, and come out Asses, Plain truth to speak; An’ syne they think to climb Parnassus By dint o’Greek! If honest Nature made you fools, What sairs your grammars. What signifies the life o’man, An‘t were na for the lasses, O. Green grow the rashes, O; Green grow the rashes, O; The sweetest hours that e’er I spend, Are spent amang the lasses, O. There is no such uncertainty as a sure thing. Inspiring bold John Barleycorn, What dangers thou canst make us scorn! Wi’ tippenny, we fear nae evil; Wi’ usquebae, we’ll face the devil! I pick my favourite quotations and store them in my mind as ready armour, offensive or defensive, amid the struggle of this turbulent existence. 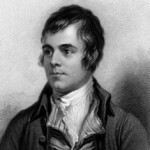 Robert Burns was a Scottish poet and a lyricist. He is widely regarded as the national poet of Scotland and is celebrated worldwide. He is the best known of the poets who have written in the Scots language, although much of his writing is also in English and a light Scots dialect, accessible to an audience beyond Scotland.